Zipping through portals is tricky enough if first person games make you feel sick, and doing it while upside down could only have made it worse. If you're one of the poor unfortunates that experiences motion sickness and nausea when you play first person shooters, then you probably owe Valve a pretty big thank you. 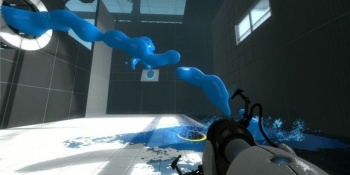 Portal 2 writer Erik Wolpaw has revealed that Valve originally planned to include a gel that let you walk on walls in Portal 2, but dropped it after it made people queasy. Of all the different kinds of stories that you could tell about videogame development, quirky ones like this are probably the most interesting. It's one thing to know that a feature was removed because it had memory glitches or something mundane like that, but it's quite another to learn that something got ditched because it was making people feeling sick, or making them sleepy, or something else equally bizarre.